Hitler's Secret by William Osborne. Review: Leni, are you okay? asked Otto. They heard gunshots as they ran threw the war zone. Hitler's Secret by William Osbourne is a fascinating book if you like stories about World War II. Otto and Leni are sent on a top-secret mission in Germany. They are sent in by plane; then an old farmer drives them to town. In the story they go on very many different parts of their mission. At one point they steal bikes in order to get around. Not only do they have to spy on Hitler, but also have to do many other tasks that are dangerous. Later in the story, Leni and Otto kidnap a lady. Then they see a police car outsideÉwill they get caught? Hitler's secret was one of the most interesting stories I've ever read. It was very suspenseful and best for six graders and older. It is extremely high level reading book because of all the high-level vocabulary. It is also in some parts gruesome for younger kids, maybe a little bit too descriptive for anyone younger than sixth grade. For example, it included content about blood and other gruesome things. The story has a very realistic timeline and plot. In the beginning of the story, Leni eats an English candy bar and Otto says, "Are you insane? You brought English chocolate with you? How are you going to explain that if someone stops us searches us?" If you didn't know it was historical fiction, then you would think is real. You might want to research about World War II a little bit before reading this book considering it includes terms that some people may not understand. I feel like I'm there every time I open the book. The author used descriptive words such as "crisp blue sky in the early morning sun slowly rose over the green fields." I find that I would want to read this book cover to cover multiple times. I plan to buy a copy for my cousin. If you haven't read this book, I highly recommend it! We would like to thank Scholastic for providing a copy of Hitler's Secret for this review. 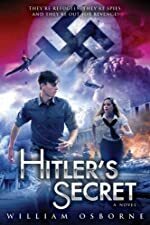 Have you read Hitler's Secret? How would you rate it?